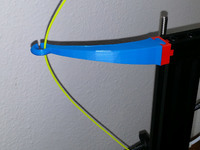 MMU2 PTFE Tube Holder by StuffByRyan is licensed under the Creative Commons - Attribution - Non-Commercial license. This part is intended as a means of raising the PTFE tubes in the back of the MMU2 off of the heatbed. By taking the tubes straight back the tubes are organized and don't flop against the printer. Furthermore, they can be cut shorter than stock, so less friction will be caused from filament traveling through the PTFE on load/unload movements. I've found this attachment works to support setups where the spools are oriented directly behind the printer as well as configurations where spools are situated above the printer (shelf, RepBox, etc.). The assembly is straightforward. Simply remove the two hex screws on the top of the MMU2 and use the same holes to align the new part and attach it with M25 screws. There is also an option of adding Festo connectors to the attachment. 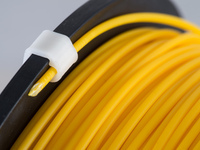 By adding Festos you will prevent the PTFE tubes from moving back down the holes when a new filament is first added. If you choose not to use Festos the PTFE tube should be longer than what is pictured to prevent it from being pushed completely back down the hole. For the easiest assembly of the Festos they should be added before the part is attached to the MMU2. To aid in installation you may want to try putting a PTFE tube through the Festo to help align it to the part when screwing them in. This should print fine without any supports. 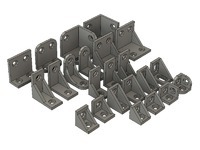 If there are issues with bridging, some supports may be required to help with the curved openings on the bottom. Say thanks by giving StuffByRyan a tip and help them continue to share amazing Things with the Thingiverse community. We're sure StuffByRyan would love a Tip, but unfortunately they have not setup their accounts to receive them yet.